"...about 150 of them had walked there through the city centre from the Aislinn Centre on Jervis Street, with Christine’s husband Donal, her daughter Cliona, sons Darragh and Conor, close friend Carmel McDonnell Byrne, and Senator David Norris. The Aislinn Centre was founded in 1999 by Christine Buckley and Carmel McDonnell Byrne to assist people who had been in residential institutions as children. Many on the walk wore a white solidarity ribbon on their lapels with a metal image of the GPO attached, signifying the 1916 Proclamation of Independence and its promise to cherish all the children of the nation equally. I heard that this morning. Sean O'Rourke seemed quite taken aback. Wonder how long Ferriter will remain on that advisory committee? "I presume what the Taoiseach is referring to is an expert advisory group that was appointed by the state two years ago of which I am a member and the idea is that we would advise the state on how they might approach certain of the commemorations and remember there's a difference between the official State commemorations and what people might choose to do outside of that. “The idea is the Government will make a decision, or even, has made a decision that there will be a royal presence or they will be invited and then perhaps they are going to ask an advisory committee where should they be placed." Last edited by PaddyJoe; 11-04-2014 at 10:56 PM. After 1971 the government suspended the commemorations. This was on the pretext that it was too volatile an event given the background of the deteriorating civil unrest in the 6 Counties. But I think the political establishment have always been uneasy about commemorating 1916 simply because such commemorations validates resistance. The protest was a little bit before my time so i don't have all the details. I heard about it many years ago from someone around at the time who is politically conscious, i must put him over it again. The protest was organised by a group of PDs - the Peoples Democracy Movement, that is; you'll never hear me refer to that micro-party that was a strange mix of FF cast-offs (Dessie O'Malley), anti-socialist Labour Party liberals (Geraldine Kennedy), and anti-Labour Party Fine Gaelers (Michael McDowell), as well as just opportunists from here and there (incl. Mary Harney). If anyone knows anything concrete about these PD protests from the turn of the 70's feel free to share here. Photos would make my year! Sss-hh. Don’t mention the lack of sovereignty in the Irish state. The acknowledgement of the 1916 Rising by the Establishment and its nauseating, craven lackeys is simply a political convenience devoid of any real meaning! The annual commemoration was revived a few years back and takes place under heavy (armed) security. Good on ya Cass.... FG, in a coalition government, having managed to sidetrack all many the other issues by tabloid treatment and forcing RTE to spend a fortune on the royal visit and the state visit, I presume the '16 commemorations will fit nicely into the '16 GE timing?? I wonder whom will FG commemorate, Dev or Collins? I agree with Saoirse: the State events will be a farce and people will find their own way of celebrating. Just looked back at what the Queen said. Very carefully worded; includes government, WWI anniveraries as well as the events (plural) that led to independence. "My family and my government will stand alongside you, Mr. President, and your ministers, throughout the anniversaries of the war and of the events that led to the creation of the Irish Free State." If the details of the visits are already a fait accompli, then our discussions will have no effect, but I imagine the planners will note reservations and sensitivities. I think that the commemorations of the Easter rising and war of independence actually embarrass the government. They look at the whole 1916/23 period through this century's PC mentality. How dare the ordinary people claim ownership of our history, that is for the them and the historians to analyse and dissect, along with the likes of Harris and Myers, to sanitise and throw accusations at long dead freedom fighters...for that is what they were, whether it was for sectarianism..socialism..adventurism or vengeful reasons, it was all about independence. During QE2s visit, there were snipers on the rooftops (not sure if UK or Irish) and a lock down in central Dublin. I'm sure planners will make their plans for 1916. I hope that there are a lot of events of celebration, or maybe one big one, that people can take part in without having to give crediblity to the Government's ghoulish efforts to bury what 1916 was about. On Saturday May 3rd @ 13:00hrs in Arbour Hill, Dublin. We'll be hosting an independent commemoration in honour of the 16 executed leaders of the 1916 Easter Rising. Speakers on the day are: Dee Fennell, Malachy Steenson, Margaret McKearney & Tom Stokes. May 3rd marks the date executions began with, Thomas J. Clarke, Thomas MacDonagh and Pádraig Pearse being the first. Joseph Mary Plunkett, Edward Daly, Michael O’Hanrahan & William Pearse, May 4th. Éamonn Ceannt, Seán Heuston, Con Colbert & Michael Mallin, May 8th. James Connolly & Sean MacDiarmada, May 12th. May they eternally rest in peace. This is an independently run commemoration and ALL are welcome. No party banners allowed only relevant flags and banners. Anyone attending and wishing to lay a wreath are welcome to do so. Anyone doing so is asked to contact one of the page admins prior to event. We'll be gathering at the gates of Glasnevin Cemetery to be lead by a lone piper, Easter Sunday (April 20th) at 1pm. Speakers are Tom Stokes, who is a descendent of John Stokes who fought in the Bolands Mill garrison and Noel Hughes, historian and Dublin IRA veteran. As with all of our commemorations they are non-party political and we hope to see as many people, especially families, to come and commemorate our Patriot Dead in a manner befitting their memory. HONOUR IRELAND'S DEAD - WEAR AN EASTER LILY. The commemoration will be chaired by a member of the Tomás Allen 1916 Society, Meath. It's a jointly-organised commemoration by the two neighbouring Societies in Leinster. 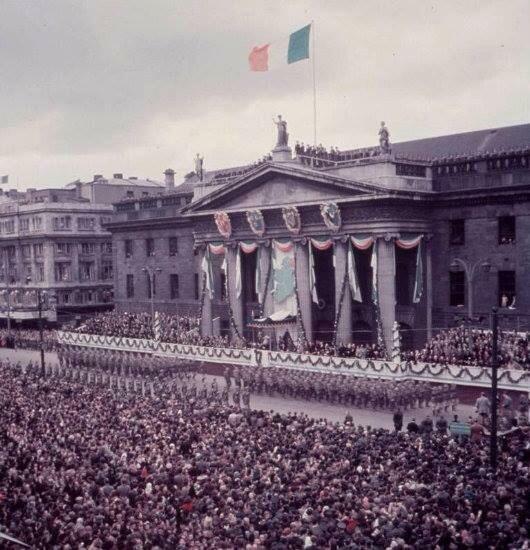 I am old enough to remember the fiftieth anniversary of the Easter Rising in 1966, which had a significant impact on me as a young member of the Republican movement. It was a year that saw a revival of interest in the writings of James Connolly. Their publication influenced not just a younger generation of republicans, but trade unionists, Labour Party activists and people on the left generally. This renewed interest was not always welcome. Éamonn Mac Thomáis, a leading member of Sinn Féin at the time, hung a banner on the party’s headquarters at 30 Gardiner Place, Dublin, to remind younger members where their true allegiance lay. It bore the legend: “We Serve Neither Queen nor Kremlin”, invoking the memory of Connolly’s banner on Liberty Hall fifty years earlier that proclaimed “We serve Neither King nor Kaiser”. To be honest some of us were neutral on the side of the Kremlin in 1966, just as Connolly had been neutral on the side of the Kaiser in 1916. Whatever thoughts Éamonn hoped to inspire in those of us in danger of being seduced by communism he certainly inspired a café proprietor down the road to put up another banner announcing “We Serve Hot Soup”. We should never underestimate the power of the commercial imperative to override politically inspired good intentions, or indeed bad intentions. Why are official 1916 commemorations so often held on Easter Sunday instead of Easter Monday? I am thinking more of the official state commemoration than those of civil or political groups. The rebels of 1916 were careful not to fight on Easter Sunday. It amazes me that the Christian churches seem to have no problem with a fully-armed military parade being held on the holiest day of the Christian religion.